Sure, we can see where she’s coming from, (as this trend tends to resurface every year), but after a cold and grey winter, can you blame us for craving bold and beautiful colours? But if Miranda says no to florals… how about a vintage Emilio Pucci print instead? Emilio Pucci was a designer born in Naples, Italy. He was best known during the 1950s and 60s, when his designs took the fashion world by storm. The 1940s had seen a shift back towards stiff, heavy clothing and Pucci challenged this with his light, fluid garments (Mansour, 2018). What were the elements that made up a Pucci design? His silhouettes were freeing and joyful. He became infamous for his abstract, lively patterns that sometimes used up to fifteen different colours – they were kaleidoscopes of “lemon yellows, bougainvillea pinks, frosted lilacs, azure blue, and almond green” (Mansour, 2018). His signature geometric prints could be seen on dresses, pants and tops, and were made from fabric Pucci created himself. Today, we know these materials as silk stretch jersey and cotton jersey (Mansour, 2018). In the 50s and 60s, these lightweight garments were innovative and quickly became favourites of fashionista jetsetters; the dresses were easy to pack in a suitcase and didn’t wrinkle (Paolo, 2012). It girls around the world wanted dresses by Pucci, including starlets such as Jacqueline Kennedy Onassis, Lauren Bacall, and Elizabeth Taylor (Morris, 1992). Pucci collaborated with Marilyn Monroe, and the collection features vibrant dresses that fit the natural curves of a woman’s body (Ritchie, 2018). Marilyn Monroe in a green and pink Pucci design. She was one of the It Girls that loved his dresses. Pucci also designed accessories and handbags, along with sleepwear and lingerie. His designs even extended to dish towels, bath products, jewellery and wall décor (Morris, 1992). Pucci’s prints play with optical illusions and he always stitched his name into his garments. Today, Pucci’s influence and his bold patterns can still be seen on the runways and in retail stores. There’s nothing quite like making a statement while wearing a cheerful print! 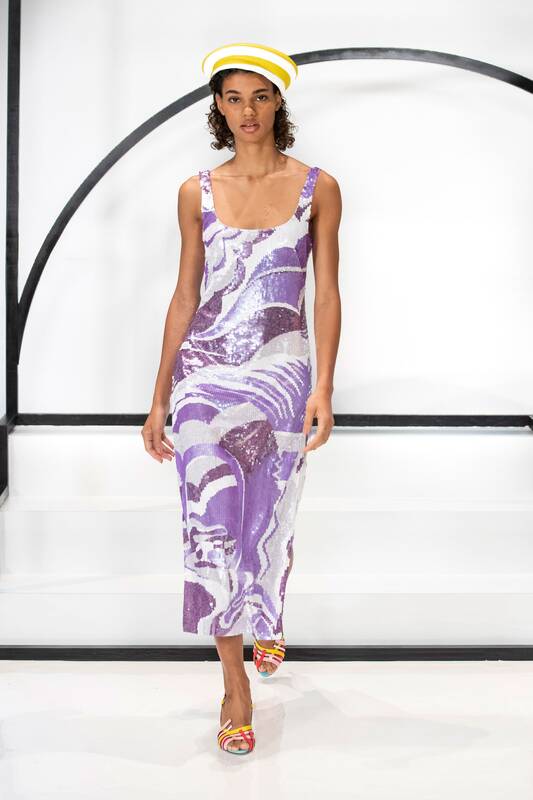 Pucci Ready-to-Wear Spring 2019; decades later, and the original “Pucci print” still lives on and thrives.